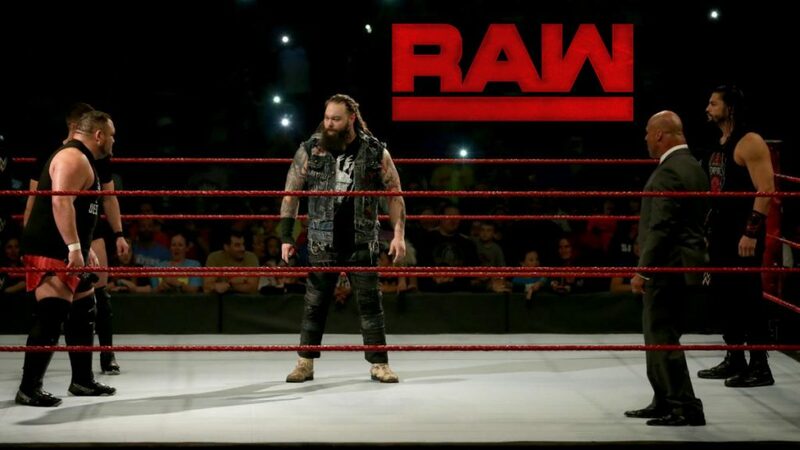 Last Monday, Roman Reigns attacked an already injured Braun Strowman. Kurt Angle makes his way to the ring. Angle informs everyone that Braun Strowman suffered a shattered elbow last week and might be out of action for up to six months. The question now is, who will challenge Brock Lesnar for the Universal Title? Angle decides that there will be a fatal five way extreme rules match (at Extreme Rules) to determine the number one contender. The participants will be Seth Rollins, Samoa Joe, Finn Balor, Bray Wyatt, and Roman Reigns. As Angle is about to leave, Roman Reigns comes out and heads to the ring. Reigns says there’s no need for a match because he is the number one contender. After all, Reigns beat The Undertaker at Wrestlemania and put Strowman in an ambulance. Finn Balor then heads to the ring. Balor reminds Reigns that he was the first Universal Champ and never lost the title. The line starts behind Balor. Reigns tells Balor that he doesn’t have a killer instinct. Balor reminds Reigns that he beat Reigns during Balor’s first night on RAW. Samoa Joe then decides to head to the ring. Joe says this is about two things: actions and results. Joe says he will enter the fatal five way and win. The lights go out and Bray Wyatt appears in the ring next. Wyatt can feel everyone in the ring trembling. As he’s talking, Seth Rollins interrupts and heads to the ring. Rollins says Extreme Rules is still a few weeks away, and Rollins wants a fight tonight. With Joe. A brawl breaks out in and around the ring with Finn Balor eventually standing tall in the center of the ring. Reigns, Rollins, and Balor argue. Angle breaks it up by setting up matches for tonight. This was okay. It was a little frantic and there was a moment where Sheamus had to kick Matt twice in order to get him to fall off the apron, but the match was okay for what it was. It wasn’t a great match, but I liked it. I liked how the ending might have been a little surprising, but it made sense because of what happened in the match. I also like that they’re building a little story around Sasha and Alicia after their brawl in the tag match from a few weeks ago. I approve of all of this. A good match. Even the ending didn’t really detract too much. It leaves the door open for a rematch which seems to be the entire point of the match. The action was good, and I expect the next match will be better. I’m sure it will take place at Extreme Rules there will be some sort of stipulation (no DQ or, I guess, extreme rules most likely). Charly Caruso asks Finn Balor about his match with Reigns. Reigns may be the “Big Dog,” but there’s a lot of fight in Balor. The ring might be Reigns’ yard, but it’s Balor’s universe. Alexa Bliss heads to the ring. She starts off by insulting New Jersey and the crowd. She thinks that the losers in Newark should feel honored to be in the presence of a winner. As she talks about being a goddess, Bayley interrupts and heads to the ring. Bayley informs Alexa that she’s invoking her rematch clause at Extreme Rules. Alexa tells Bayley that she will never get extreme, unless it’s extreme hopscotch. Bayley should leave the championships to the adults. Bayley then attacks Alexa, but Alexa grabs a kendo stick from under the ring and hits Bayley in the back with it. The Miz tells Kurt Angle that he isn’t happy after their match. Angle tells Miz that he’ll get a rematch at Extreme Rules, but Miz says that isn’t good enough. He wants a match where the title can change on a DQ. Angle agrees. As Maryse starts to yell at Angle, Elias Samson walks up and kills the segment. Good match. It was fast and a little frantic, but it was fun to watch. It was a good way to keep interest in the title feud without either person involved getting pinned. Kurt Angle checks on Bayley in the trainer’s room. Angle tells Bayley that their match at Extreme Rules won’t have any violent stipulations. Bayley insists that she wants to get extreme, so Angle tells her that she will face Alexa for the title in a Kendo Stick on a Pole match. Angle seems excited about the idea, but Bayley seems a lot less enthused. R-Truth tells Goldust that he feels bad about their loss last week. Goldust says they’re a team, and when one falls the other is there to pick them back up. They can start their climb to the top tonight. Together. Very good match. Reigns came into the match inured, but he had a good game plan to even the odds by focusing on Balor’s ribs and back. A lot of his moves were focused on that area of Balor, and his game plan helped make the match interesting. Balor looked very good as usual. This was a good, hard fought contest. Bray Wyatt says he will take the spear of destiny and deliver it into the heart of the beast, becoming the new Universal Champ. But tonight, he wonders if Seth Rollins can stand up and look evil in the eyes. Charly Caruso welcomes Seth Rollins. Rollins says that after the year he’s had, Bray Wyatt won’t stop tonight, and Wyatt won’t stop Rollins from going on to face Brock Lesnar. Golden Truth comes out for a tag match. After their song and dance ring entrance, Goldust attacks R-Truth from behind. Goldust stomps Truth and throws him from the ring. The attack goes on for a while until Goldust eventually leaves Truth lying in the middle of the ring. Enzo Amore and Big Cass head to the ring. As Enzo starts talking being in his hometown, Titus O’Neil interrupts and introduces Apollo Crews (while insulting New Jersey). Titus mocks Enzo and Cass’s entrance and proclaims that Apollo is going to beat down Enzo in the next match. Big Cass corrects Titus, saying the match is actually between himself and Titus. Titus says he isn’t dressed to wrestle. Cass doesn’t really care. Not much of a match, but it was a fun little segment. After the match, Enzo Amore tries to take a selfie with Titus in the background. Crews takes offense and kicks Enzo in the head. Neville tells TJP that he did well tonight. TJP still wants his title shot, but Neville says they still have more work to do. Neville tells TJP that they will end Aries tomorrow night on 205 Live. Pretty good match, but the fact that Samoa Joe was the only one of the five guys from the first segment who didn’t have a match made it feel like we were just waiting for him to attack Rollins during this match. And we were. After the match, Samoa Joe continues his attack on Seth Rollins. Bray Wyatt hesitates for a moment, but then joins Joe in attacking Rollins. Wyatt then hits Joe with Sister Abigail before doing the same to Rollins. I liked the show. I like all the little stories they have going on while the bigger stories keep moving along. I’m interested to see more of Alicia Fox and Sasha Banks, I want to see what’s next for Goldust, and I think they might have found a way to make Apollo Crews interesting. I also like how the absence of Braun Strowman has really opened things up at the top of the show. I don’t like to wish injuries on anyone, but I’m not too broken up that Strowman will be off of TV. I think that’s a good thing because he was really over-saturated. This was a solid match with a good story told through the action. Definitely the best match of the night.